Re-fill and drink from (almost) any SOURCE – that’s what you get from our new Filtering Hydration Systems in cooperation with Sawyer. Here’s the top 5 things to know. 1 – So how does it work..? 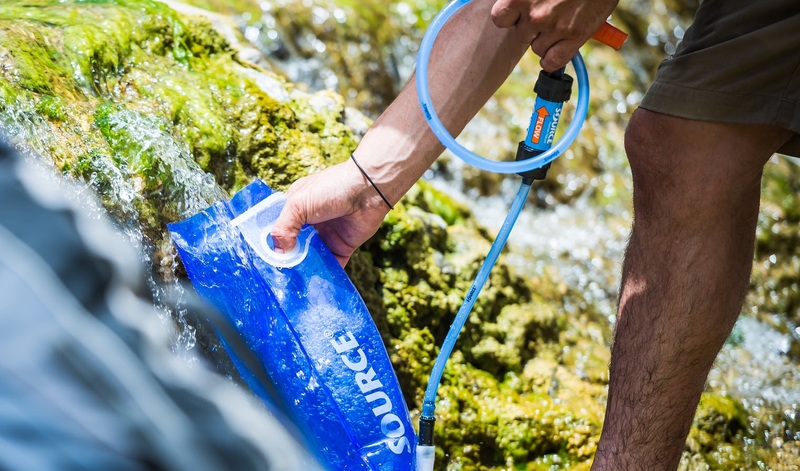 The SOURCE Filtering Hydration System incorporates a Sawyer Mini Water Filter, weighing just 2 ounces and filtering up to 100,000 gallons without chemicals, purifiers, add-ons or parts that need replacing. Just backflush periodically when flow slows down. Find more info on the care and use on the SOURCE product pages. 2 – Does it remove taste and color? The Sawyer filter removes taste that comes from bacteria, dirt, and green matter. The Sawyer filter does NOT remove iron, sulfur, other chemicals, or simple compounds. Taste can be masked by using flavor additives like Gatorade or crystal light (filter needs to be cleaned immediately after using them, otherwise there could be residual taste). 3 – Can i use it with my electrolyte drink..? If you’re adding electrolytes to freshwater picked up from any source on the trail, the electrolyte will dissolve and pass through the filter – while the harmful bacteria and protozoa will not. It’s just like filtering salt water, you can’t remove the salt as it becomes a solution. It’s on a molecular level. However: the fibers of the filter may absorb some of the taste and flavoring from the electrolyte tablets and there could be residual taste. We recommend backwashing your filter with warm water after using the filter with electrolyte tablets. 4 – Re-fill and drink from ANY Source of water? Unless you are traveling in developing countries where waterborne viruses such as hepatitis and Polio are present, Sawyer filters take care of all your fresh-water SOURCEs in the western world. As the filter absorbs 99.99999% of harmful bacteria and 99.9999% of protozoa, you’ll even be ok drinking from muddy standing water out in the woods – but it is not recommended as your filter will need backflushing sooner the more dirt and particles are in the water, and the taste and color of the water will not be perfect. Still: you’ll be safe. 5 – So what about viruses in the water..? As viruses are smaller than the Sawyer Mini Filter’s threshold, here is the Sawyer lab’s official answer: “In North America we do not have concerns about viruses in our water. They simply cannot survive. Viruses derive from contaminated human sewage and die shortly after entering a body of water.” Thus, as long as you are not planning on traveling to a developing country, you are safe to drink from any source. Sawyer filters have been tested and approved by independent labs (find scientific test reports for download on the Sawyer website).